Do you know a committed youth worker who has at least five years of direct impact in service of K-12 Indiana youth? 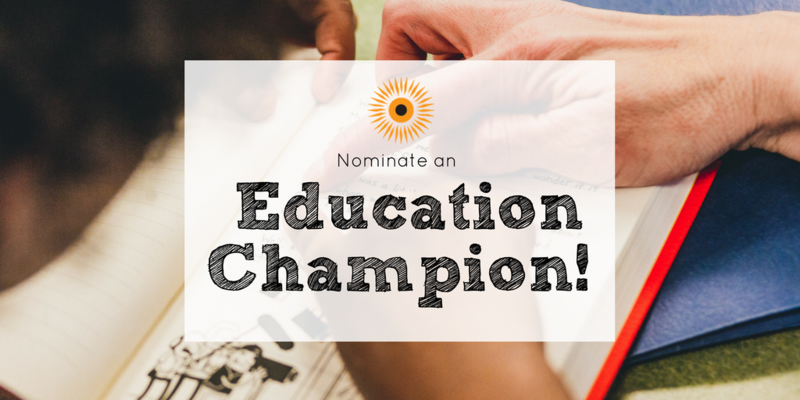 Nominate them to be the 2019 Education Champion! The School on Wheels Education Champion award recognizes an individual who devotes their time, expertise, and focus to supporting youth and championing education in Indiana. This simple two-step process celebrates champions of education and has a lasting impact. Step one: Take just 5 minutes to nominate an educator or youth worker who is doing great things in Indiana! Step two: Follow up with your nominee and encourage them to fill out the five short essay questions they’ll be sent by School on Wheels. The 2019 School on Wheels Education Champion Award winner will be selected by a panel of judges. The winner receives public recognition and a $1,000 stipend to use towards a project or program that will benefit his or her students. Nominations are open January 18 - February 17, 2019.